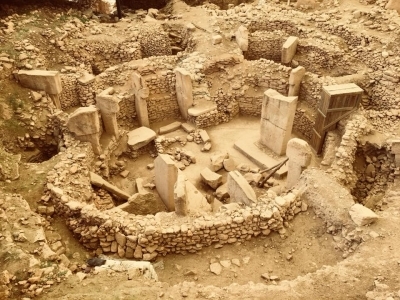 Göbekli Tepe comprises the oldest known monumental megalithic structures in the world. The archaeological site covers a tell of ca. 15m height. From the 10th–8th millennium BCE, circles of massive T-shaped stone pillars were erected. More than 200 pillars in about 20 circles are currently known through geophysical surveys. The pillars are richly carved with images. Visited April 2018. After one year and a half the site is open now to the public. The new visitors centre, ticket booth and a parking guard booth have been built (not without a controversy), as well as a road/path leading to the site itself which was covered with a some kind of roof. When I was there, no entry or parking fee was collected. The site is pretty small – just four circle temples one next to the other. You can walk around them and look from above – it won’t take more than one hour. Recently they started new research close by but not open to the public yet and won’t be open for a longer while. Probably you will meet Mahmut Yildiz, who “discovered” the temple 23 years ago together with his father. He was helping prof. Schmidt and now works there as a security guard. For now there is no local guide there who can explain you what you’re looking at. To better experience the site you should read Schmidt’s book and what videos available in internet (suggested by Solivagant). Or you can hire a guide from new Archaeology Museum in Sanliurfa – the visit to the museum is a must, because most artefacts found in Gobekli Tepe are displayed there; admit at least two hours to see museum exhibitions. The site is very well signposted while coming from Sanliurfa (on Tentative list). No public transportation. 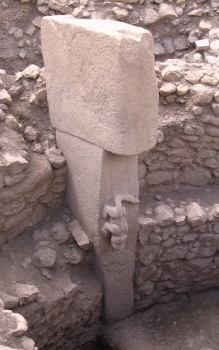 The publication in 2001 by Prof Klaus Schmidt (KS) of a preliminary report of his excavations at Gobeklitepe following the site’s discovery in 1995 turned the archaeological theories about the Neolithic Age upside down. He dated the site at c11600ybp (6000 years before Stonehenge and 7000 before the Egyptian Pyramids) and concluded that “Based on the ostensible fact that only “wild” or non-domesticated plant remains and animal bones had been found – … it was constructed by hunter-gatherers who must have periodically come together for ritual reasons. (he) then suggest(ed) that ritual or religion spurred the domestication of plant-animals and caused the Neolithic Revolution” or, as KS more succinctly put it, “First came the temple and then the city”! Such theories are not yet fully accepted and are being developed as digging takes place. KS died in July 2014 aged only 51 but the location continues to be a focus of World wide archaeological attention. Indeed it is something of a surprise that Turkey should have put it forward for inscription at the 2017 WHC which will require submission of papers in Jan 2016. This is a highly active dig whose significance is still under debate and assessment. What will ICOMOS make of it? Can such a site be managed as is required of a WHS? Gobekli Tepe was the physical “turning point” of our 6000km drive around Turkey from/to Istanbul. In some respects it was also the major goal - and this in a journey during which we made our first visits to, inter alia, Hattushas, Nemrut Dag, Catlahayuk, Ephesus, Pergamon and Troy. Somehow these all seemed less mysterious, even less significant. Perhaps we had succumbed to the hype of our pre tour preparation! As well as reading many Web based articles we had also read the National Geographic article of June 2011 and watched NG’s video. 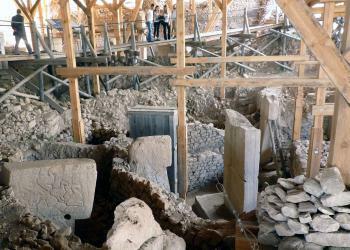 Also a video titled “Gobekli Tepe Belgeseli - The first temple” (both are on YouTube). So it was with some excitement and anticipation that we neared the site! It might be of interest to anyone thinking of driving that we had left the top of Nemrut Dag at 10.45 and reached Gobeklitepe at c2.15. You will need between 1 and 2 hours there – my view would be that 2 “circuits” are worthwhile. It is situated a few kms NE of Sanliurfa but its “newness” means that it is not well marked on maps. It was not shown on our otherwise excellent “Reise Know How” road map and, to find it on Google Maps, you will need to enter “Gobeklitepetourism” - where it has been added under that name by a user! As far as I am aware there is no way of reaching it from any slip road off the new Sanliurfa northen by pass (O52) which passes nearby. Instead you need to go into Sanliurfa and exit east on the old Mardin road (the 400). After a few kms you will pass the John Deere showroom and it is signed north soon thereafter with a U Turn to cross the carriageway to get to it. There follow a few kms of rough road and several signed turns and then suddenly you reach a bright shiny new “Visitor Centre”, a picnic area and what might one day be payment booths and barriers. But you are not there yet! It appears that the plans for the site include this Visitor Centre which opened in 2014 from where there will be a shuttle service to the actual site which is still 800m away. The problem apparently is that the remains of Gobeklitepe were deliberately covered by Neolithic man and, so far only around 4% of the site as identified by sonar has been excavated – just 4 stone “circles”. Many more are thought to exist under the ground so it was simply not acceptable to build a visitor centre any closer! So, for the moment, cars are allowed along the rough track to a small ramshackle car park and a few porta-cabins. A man sitting under an umbrella collects 5TL for entry (no electronic “guichets” here yet unlike many Turkish WHS!) and you are in. Then comes what was perhaps the only disappointment of the visit – the sight of a very ugly, and hopefully very temporary, wooden structure covering the excavations and through which a walkway passes. The problem seems to have been that deep foundations had to be avoided and that the structure has been given “integrity” via a large number of pillars and diagonal cross pieces. Unfortunately these obstruct views of some of the stones and carvings. Gone for ever are the views shown in the NG video of the stone circles under the sky. I have seen photos of an intended “permanent” cover in steel with a lightweight membrane roof (planned “before” and “after” are here - https://www.facebook.com/pages/G%C3%B6bekli-Tepe/165067543557468 ) but there doesn’t seem time for it to be constructed before the planned inscription in summer 2017. It appears that “The Global Heritage Fund (GHF) …..has been working at the site to support the preparation of a site management plan and conservation plan, the construction of a shelter over the exposed archaeological features, training local community members in guiding and conservation and aiding Turkish authorities in securing World Heritage Site inscription” (April 14). The GHF has several reports about the development of the site on the Web. Under the shelter are 4 stone circles, grouped A and D, C and B. Despite the pillars, posts and struts it is perfectly possible to make out the famous anthropomorphic stones :- arranged in a circle surrounding 2 larger important central ones which face each other. Luckily we carry binoculars and these were very useful for examining the carvings on the stones since the walkway doesn’t go completely round each circle. Signage is excellent in Turkish/English with detailed plans, text and photos and we were able to identify most of the carvings. These include a variety of creatures and also arms and hands, belts and loin cloths down the front and sides which show that these strange shapes were intended to be humanoid in form – though whether “human” or “god-like” is open to interpretation and no features are ever shown on the “head”! The incisions are mostly wonderfully “sharp” and fresh. For the most part the viewable sights are all “under cover” though there are a few carvings on exposed bed rock near the entrance and lots of pits of ongoing excavations (we were told that, if you arrive in the morning you can see these taking place). My view would be that to visit the site without significant preparation in the form of reading and viewing videos would be to miss out. The site is something of a jumble and, despite the good signage, the significance of what one was viewing would be somewhat lost without understanding the history of the site’s discovery and the theories about its place in human development. Incidentally, as part of its “offensive” towards gaining WHS status and increasing its tourist numbers, Sanliurfa (A fine city of almost 2 million people which is on Turkey’s T List in its own right) has been upgrading its small Archaeological museum and transferring to a new building. Unfortunately it was still closed when we were there in mid May 2015 but was due to open “imminently” (TripAdvisor seems to indicate that it now has?). It will contain a major section on Gobeklitepe and link to other relevant local discoveries (E.g “Urfa Man” claimed as the World’s oldest known human statue). It would seem to be an essential stop. On which point it is worth mentioning that the discoveries at Gobeklitepe have left the museum world behind the game. The place doesn’t even get a mention in the rather tired exhibits at the Istanbul Archaeology Museum and the Museum Of Anatolian Civilisations in Ankara, which is organised chronologically, has had to insert a rather thin section just inside the front door where “hunter gatherers” are situated! All the exhibits are copies – regional musea in Turkey seem to be flexing their muscles now and insisting that they get to display locally discovered articles. If/when I get round to reviewing the T List site of Zeugma I will be referring to the magnificent mosaic Museum (The “world’s largest”!) in Sanliurfa’s nearby rival city – Gaziantep. I also understand that all discoveries from Catalhoyuk now go to the Konya museum. My wife Jan and I visited Gobeklitepe about five years ago. It was just at the end of the dig season so there weren't many people (or tourists) at the site. We were guided through and around the site by a young man who was very familiar with all that had gone on. Unfortunately he spoke no English so my Turkish had to suffice. Overall it is a spectacular site and one we would really like to revisit. The museum in Urfa had a wonderful display of articles found at the site. I can only imagine the additions they have been able to make since our visit. I hope that our health will permit us to make another visit. As with many of the other places we have visited in Turkiye we highly recommend it to our friends. We flew to Urfa from Istanbul, an easy connection and a very enjoyable flight. Frontier walls: A Roman era square building was discovered. It could have been a guard tower along the Limes Arabicus. Aurochs: A number of depictions of Aurochs have been discovered on the Anthropomorphic T shaped pillars (e.g - "Pillar 66 Enclosure H" and "Pillar 20 Enclosure D). An Aurochs skull with an embedded flint arrow has also been found. Neolithic age: First phase, belonging to the Pre-Pottery Neolithic A (PPNA). Second phase, belonging to the Pre-Pottery Neolithic B (PPNB). AYB Ask Gudmundsen Atila Ege Bergecn CAN SARICA Dimitar Krastev Jonathanliao Judith Tanner Kevin McFarland Liu tuo Ludvan Naim Y Nihal Ege Solivagant Stanislaw Warwas Tammy Gouldstone Tony H.